Since SUVs and crossovers are all the rage currently, Volvo is on the verge of launching the brand new XC40 in India, which is the Swedish company’s very first compact luxury SUV worldwide. However, this segment has been long dominated by the German trio, and the Volvo needs to be very special to draw potential buyers away from its established rivals. We compare the XC40 with its German rivals on paper to see how it compares. Being compact SUVs, none of these four vehicles have that substantial bulk that's generally associated with SUVs. All these vehicle are based on monocoque chassis, which makes them more of urban soft-roaders than off-roaders. While the XC40, X1 and Q3 still boast a quasi-SUV appeal, the Merc GLA looks more like a raised hatchback because of its low height. Therefore, the Merc is likely to appeal a certain niche of customers who are fond of its design in particular. 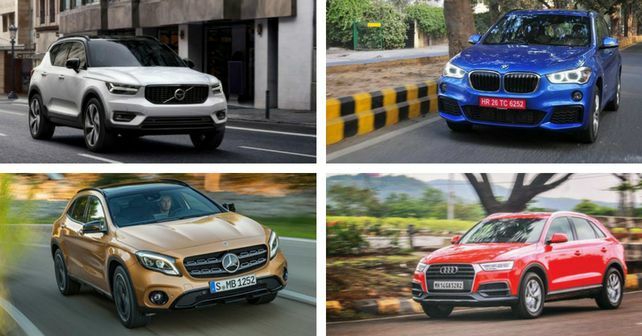 If its a petrol SUV that you are looking for, then your choice is limited to the Q3 and GLA, as the other two are diesel only offerings. However, the petrol engine on the GLA is quite a bit more powerful than that on Audi - 181bhp/300Nm versus 148bhp/250Nm, respectively. For enthusiasts, Merc also offers an AMG variant of the GLA, but that’s substantially more expensive than anything else here, so it’s best kept aside. Coming to diesels, the new XC40 will be offered in a 2.0-litre engine that produces 188bhp and 400Nm, which makes it exactly as powerful as the BMW X1. The Q3’s power output, in its 35TDI avatar, isn’t far behind. However, the diesel GLA, unlike its petrol counterpart, has the least powerful engine here, at least on paper. Even the more powerful GLA 220d lags behind the competition in power and torque departments. Manual transmission option is not available on any of these SUVs. Furthermore, while all the four vehicles are based on front-wheel drive platforms, AWD system is offered on all four – in fact, there's no 2WD option on the Volvo at all, as it's only offered in a single-spec, fully loaded variant. Coming to prices, the XC40 is yet to be launched in India. But since it will be only offered in a single, top-end trim, it’s will obviously miss out on having the lower starting price advantage. However, Volvo might bring in more variants of the XC40 eventually. From the price list, it's quite evident that Merc GLA is the most affordable compact luxury SUV in India.